Karnataka (Kannada) is a state of the republic of India located in the South West of peninsula. Created on the 1st of November 1956 as Mysore State, It was renamed as Karnataka in 1973. Its capital city Bangalore is at the forefront of rapid economic and technological development that India is experiencing. Kannada, the official language of Karnataka, is spoken as a native tongue by about 64.8% of its inhabitants. Other languages spoken languages in this State are Urdu, Telugu, Tamil, Marathi, Tulu, Hindi , Konkani, Malayalam, and Kodava . The diverse linguistic and religious ethnicities of this land, with their histories, have contributed immensely to the cultural mosaic and heritage of Karnataka. 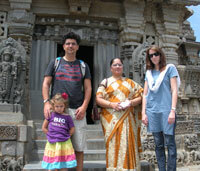 AIIS Kannada Language program is located in the historic city of Mysore. The city ( at 770MSL) with a salubrious climate is about 140 kms from Bangalore. Known as ' City of Palaces', Mysore retains a quaint charm, that never fails to enchant. Situated in the southern part of Deccan Plateau, Mysore is an undulating tableland, covered in parts by granite outcrops and fringed by verdant forests. A popular tourist destination of India, this educational and cultural center also offers several added attractions ranging from the splendid royal splendor of old Mysore ( with its fabulous Dasara Festival) to its exquisite temples, pilgrimage centers and scenic spots. The syllabus is designed according to the students' proficiency level and their focus of interest. The medium of instruction for all classes is Kannada.